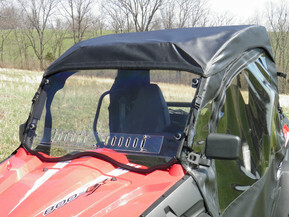 GCL UTV launches a new line of premium polycarbonate windshields for all makes and models of UTV's. Gotcha Covered, LLC recently launched a new line of aftermarket Utility Terrain Vehicle (UTV) Polycarbonate Windshields at their state-of-the-art facility located in the heart of Central Kentucky. Gotcha Covered manufactures premium Lexan Windshields for leading Utility Terrain Vehicles and markets the product line under their GCL UTV brand name. 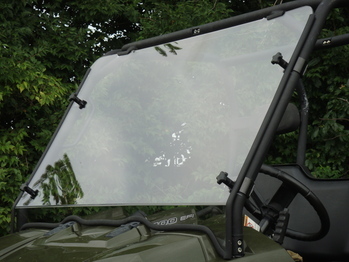 GCL added this Premium line of Polycarbonate Windshields to their UTV Enclosure accessory offerings to further support John Deere Gator, Kawasaki Mule, Kawasaki Teryx, Kawasaki Trans, Honda Big Red, Kubota, Yamaha Rhino , Polaris Ranger, Polaris RZR, Polaris Crew, American Sportworks, Husquarna and other leading UTV OEM vehicles by providing the best aftermarket polycarbonate windshield kits available in the industry. To ensure timely communication of product information to on-line customers and OEM dealers GCL UTV Polycarbonate Windshields can be viewed currently at www.gclutv.com. GCL plans to be the leading UTV aftermarket Polycarbonate Windshield provider in North America by offering more New and Innovative Designs and the best materials in the industry. Leading designs and components include ¼” gauge Lexan and Tuffic Brand Polycarbonates in gray tint and clear as well as our heavy duty “Quick Connect” windshield fastener clamping system and Automotive rubber protective edging to offer the best Polycarbonate Windshield kits on the market today. To ensure a high level of customer service, GCL fully stocks all OEM vehicle enclosures at their Kentucky facility that allows shipment to be made within 1 – 3 business days. Additionally, GCL ships free of charge to all customers within the continental United States via UPS Ground Service.